The SpaceX Dragon crew capsule underwent a pad abort test in May, 2015. LONG BEACH, Calif. — One of the difficult lessons learned from the space shuttle Challenger disaster in 1986 was the need for human-carrying spacecraft to come with emergency escape systems, a means of ejecting the crew vehicle from the rocket in an emergency. That's one requirement that NASA has placed on Boeing and SpaceX, the first two commercial companies in history to build vehicles that will carry humans to the International Space Station. Founded and helmed by billionaire entrepreneur Elon Musk, SpaceX is currently flying cargo to the space station for NASA using the company's Falcon 9 rocket and Drago cargo capsule. SpaceX is adapting the Dragon to fly humans to the station. The Dragon's escape system was directly tested in May 2015, during the craft's first pad abort test. 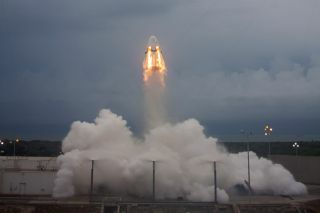 The capsule was placed on a launch pad by itself (no rocket) and controllers fired the Dragon's eight SuperDraco launch-abort engines; in the case of an emergency (like a rocket explosion) those engines would fire the craft away from danger. The Dragon was able to reach an altitude of nearly 5,000 feet (about 1,500 meters), demonstrating that it could get away from the pad on its own. But how will the ejection system perform when it's atop a rocket? SpaceX plans to do a flight-abort test in the future, said Benjamin Reed, director of SpaceX's Commercial Crew Program, who spoke at the AIAA meeting this week. During the flight-abort test, the Dragon will launch atop a Falcon 9 rocket and "get up to an [altitude] where you have the maximum forces on the rocket, and [we will] abort the vehicle from rocket at that point, and make sure the vehicle can get away safely." Boeing also plans to do a pad-abort test with its crew vehicle, known as the CST-100 Starliner. The company has already done a water-landing test of the abort system. However, Boeing will not perform a flight-abort test, said former NASA astronaut Chris Ferguson, now Boeing's director of crew and mission operations. "We looked very early on at where we could get the most testing value," Ferguson said, and "made the conscious decision" that the company could certify the vehicle in a wind tunnel and did not need to conduct a flight-abort test. He added that "we consider the pad-abort test more robust and challenging" and said the company is currently conducting many abort-system tests in a wind tunnel. Kathy Lueders, program manager for NASA's Commercial Crew Program, confirmed that NASA's safety thresholds did not specifically require an in-flight test of the abort system. The guidelines did require that the companies "show that they have the abort reliability that we needed to have. And so we provided them the ability to propose their own strategy for how they met that, and both currently are meeting the requirements." NASA's involvement in the development of the crew vehicles is far from passive, said Ferguson, who described the difference between building a launch vehicle to carry cargo for the agency and one to carry humans. He said NASA is, understandably, far more involved in the development of the human spacecraft, and has set qualifications and safety requirements at multiple stages of the systems' construction, rather than just doing a final capability check. The Boeing CST-100 Starliner crew capsule undergoes a water-landing test. It's a bit unclear when SpaceX or Boeing will launch the first commercial crews to the station. A recent report by the NASA Office of the Inspector General suggested that regular commercial flights won't happen before late 2018, due to delays that are the result of technical problems with both companies' vehicles. According to SpaceNews, the report showed that Boeing has completed 15 of 34 milestones in its Commercial Crew Transportation Capability (CCtCap) contract with NASA, valued at $1.067 billion. The report stated that Boeing's first uncrewed test flight of the CST-100 has been pushed to December 2017, and the company's first crewed flight was pushed until February 2018. SpaceX has completed eight of 21 milestones under its CCtCap contract, the report stated, adding that the company was planning uncrewed and crewed test flights in mid-2017. On Sept. 1, a SpaceX Falcon 9 rocket exploded on a launch pad at Cape Canaveral Air Force Station in Florida, two days before the craft's scheduled launch. The incident occurred while the rocket was being fueled for a routine preflight test. On Twitter, SpaceX and Elon Musk have stated that the company does not know what caused the anomaly. In the wake of the incident, SpaceX President Gwynn Shotwell stated that the company would halt all its currently scheduled launches, but planned to return to flight in November. Reed stated at the AIAA meeting that the company is "assessing the data" from the anomaly and will "fold that data back in to make [the rocket] more reliable and safe." In the meantime, he said the company is "fully on track" with the crew program. "It's full steam ahead on crew, while listening to the data." When asked about specific time lines for the crew vehicle launches, both Ferguson and Reed repeated a phrase that SpaceX representatives have used before: "We'll fly when we're ready."